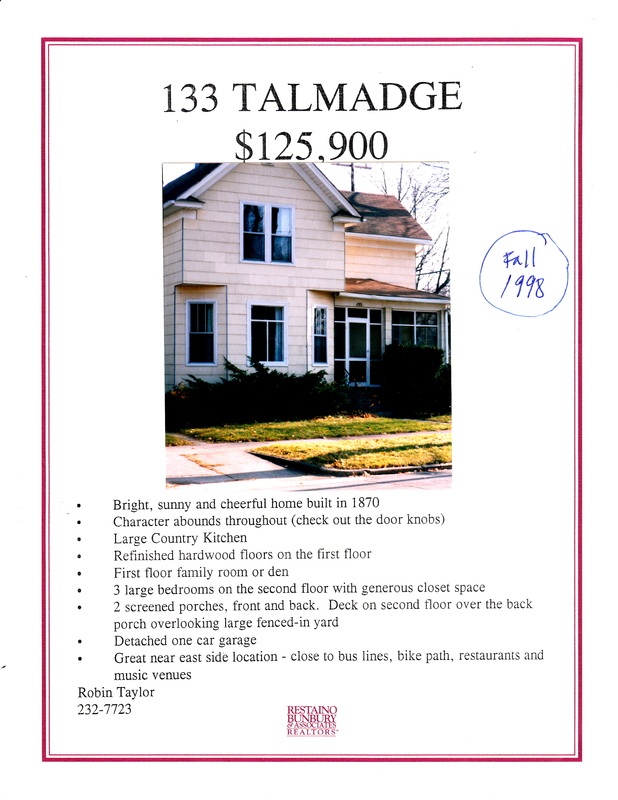 This house was used as an example in Ann Waidelich’s talk to the East Side History Club on “How to Research Your Home’s History.” The current owner wanted to know if the 1870 date on the real estate brochure was correct. By following the procedures described below it was discovered that the house was actually built in 1908! Thank you, Ann, for assembling this information for East Siders curious about their home’s history. Speltz, “If Ordinary Walls Could Talk: Piecing Together the History of My House” Wisconsin Magazine of History, Spring 2008 p. 2-17. Start with you and your history in the house: purchase date and price, remodelings, special events, etc. Identify your own pictures of the house – exterior and interior. Who owned/lived in the house before you back to who built it & who owned the land before that? 1924 – date in hard copy are at Madison Public Library – ask at Reference Desk, temporary downtown location – 126 S. Hamilton St.
NewspaperArchive – an online database available free through Madison Public Library LinkCat web site — http://www.scls.lib.wi.us/cgi-bin/auth.cgi?connectto=EHNEW – click on Databases on the general search screen, Click on Genealogy, Click on NewspaperArchive, type in your library bar code number for access. Full page and fully searchable text of newspapers from around the country – not complete, but ……. Census Records, every 10 years, now up to 1940 online through Ancestry.com or Heritage Quest, available free through Madison Public Library LinkCat Databases and at Wisconsin Historical Society Reading Room. Once you know the names of people who lived in your house you can find out family relationships, race, state or country of birth, year of immigration, occupation, etc. “Custer Cards” – Wisconsin Historical Society, 4th floor, Archives Room. Frank Custer was a Capital Times newspaper reporter who cut up newspaper articles and pasted them on 3×5 cards, arranged by subject, people and business names. McAlester, Virginia & Lee A Field Guide to American Houses, Knopf, 1991. Look on your tax bill or assessment notice or use City of Madison Assessor’s Office web site http://www.cityofmadison.com/assessor/property/index.cfm gives property details, sales details, Legal description, tax details and special assessments. Dane County Plat Maps for townships in Dane County showing land ownership in rural areas with black spots for houses Published every 2-3 years until 1960s then every year. Subdivision Maps when rural land is divided into building lots – available in Dane Co. Register of Deeds, Real Estate Division, Room 110 City-Co.Bldg. Tax Rolls (annual) on microfilm at Wisconsin Historical Society 4th floor Archives Room. Was the land that you house sits on “always” in the City of Madison or when did it get annexed into the city, where was it before: Blooming Grove, Burke, Town of Madison ? What was the subdivision name? Tax rolls document the acreage, valuation, owner’s name and name of the person paying the tax. The records can help determine the age of the house by noting changes to the property’s value from one year to the next and develop a chain of ownership similar to that found in the Register of Deeds Office. Assessment Records Madison Assessor’s Office, Room 107 City-County Bldg. Ask office staff to request the “assessor’s field notes” from storage (it will take a coule of days) They will make copies for you at 25 cents per copy. 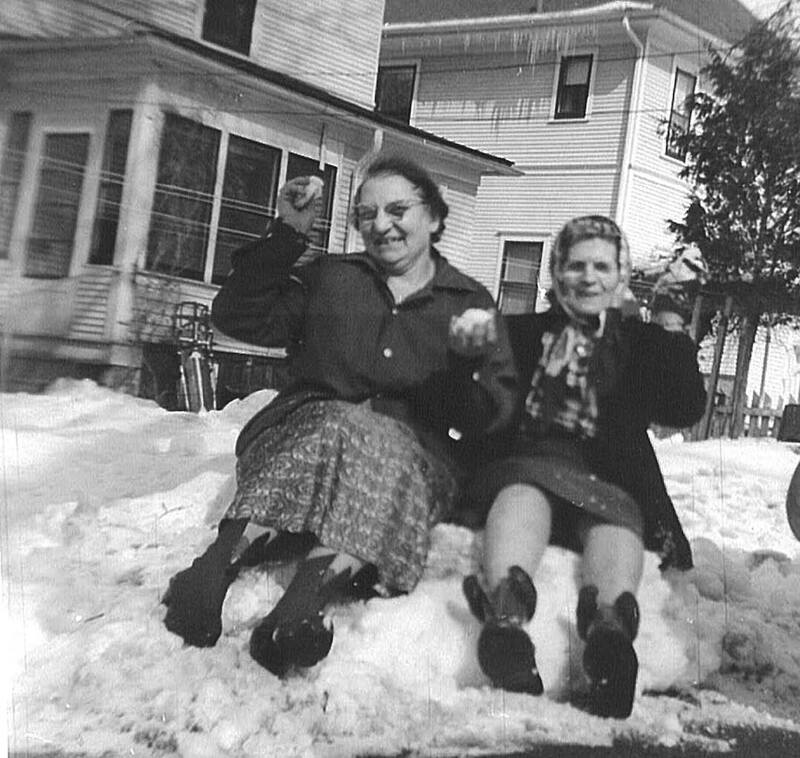 Tillie Streber, left, (Jackson Street) and Margaret Tiedt (Sommers Avenue) in the snow in February 1960 in the side yard of 2301 Sommers Avenue. Photo courtesy of Margo Tiedt. Join us 2-4 pm at the Goodman Community Center, 149 Waubesa St. $2 donation requested. Did you know deed restrictions prevent some people on Oakridge Avenue from having a bowling alley in the basement? This Saturday, Ann Waidelich will describe how neighborhood residents can research their home’s history, and discuss some of the odd restrictions affecting houses in the Schenk-Atwood area. If you have a house with an interesting history, or have found local oddities in your older home, please come and share.